To inspire and entertain you, I’ve selected six new, never-seen-before holiday design ideas featuring succulents. Do consider each as a launching point for your creativity, and feel free to share them with friends. I’d love it if you’d post photos of what you come up with on Instagram or Facebook, and tag me @DebraLBaldwin. Regardless, have fun and enjoy! Sempervivum topiary tree. This is a riff on my 2017 topiary tree. I love hens-and-chicks but only recently have grown them successfully year-round. The concept for this year’s mini-tree was one by Margee Rader in my book, Succulent Container Gardens. I used nearly 50 assorted Sempervivum heuffelii (hew-FEL-ee-eye) hybrids in 2-inch pots from Mountain Crest Gardens. When the holidays are over, they’ll join my other “heuffs” in the garden. (Most semps don’t like our hot summers here in Southern CA but so far, heuffs–which used to be classified as Jovibarba–are doing well.) 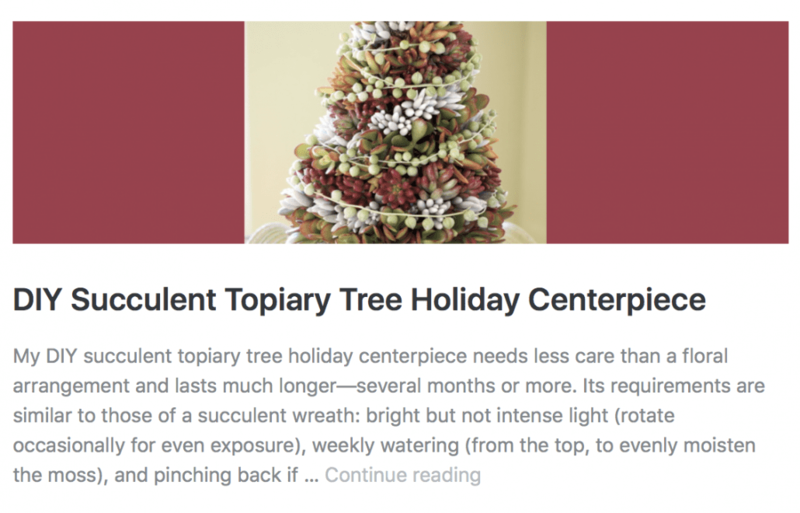 See my materials list for a topiary tree. Ready-made succulent ornaments. Speaking of Mountain Crest Gardens, the succulent pine-cone ornaments they introduced this year are a super deal. 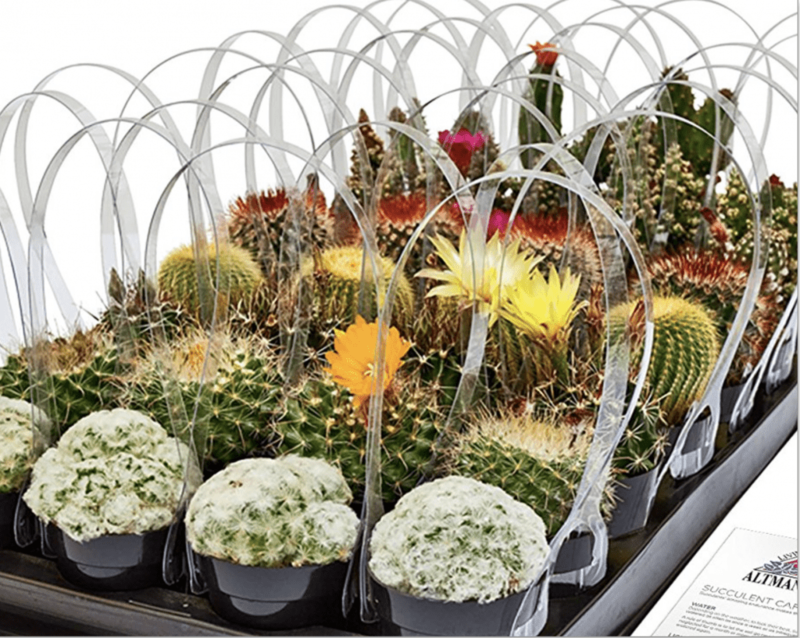 The set of three includes six sempervivums atop sequoia cones (each 3-inches tall by 1.5-inches wide) for $10. So that means you get six semps that you can wiggle off and plant after the holidays for under $2 each! Be sure to check out MCG’s other fetching succulent ornaments too. Mini succulent Christmas tree. This desktop tree is 8 inches tall with a 4-inch-wide base. To make glass balls appear to hang from branches, I held the three-stemmed cutting upside-down, dotted the leaves with white glue, then added beads. A small, shallow container makes the cutting look proportionally large and treelike. A glass jar lid sort of looks like ice, but any container will do including a flowerpot. A small floral frog (a flower holder made of metal pins) holds the cutting upright, and white sand with blue sparkles hides the frog and suggests snow. Succulent garden of lights. Every year Sabine Hildebrand of Weidner’s Gardens nursery in Encinitas, CA, decorates her own garden with holiday lights. In December night falls by 5:00, so Sabine and husband Rob enjoy their glowing garden for hours every evening. She keeps the design simple—no colored or twinkling lights—to showcase the plants’ shapes and colors. There’s not much difference in decorating succulents instead of shrubs, Sabine says. “Do it late in the afternoon so you can see the results as it’s getting dark. 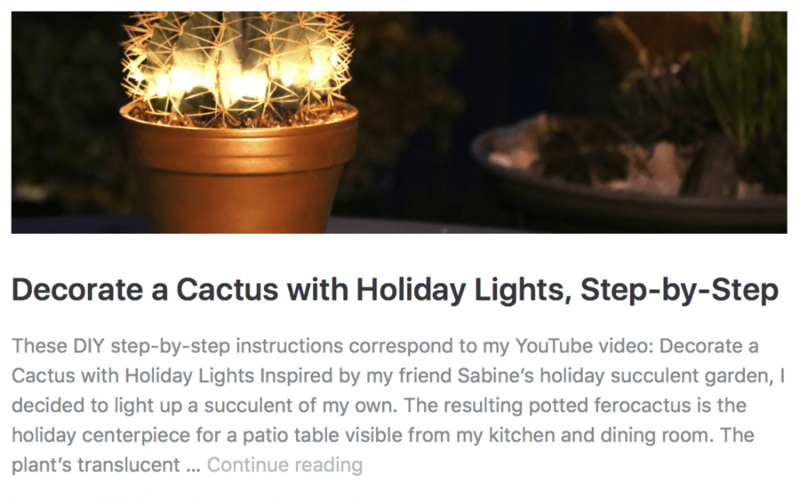 Then rearrange the strings of lights as necessary.” See more in my new YouTube video: Sabine’s Holiday Succulent Garden. Ferocactus glaucescens in a gold-painted terra-cotta pot glows with mini lights. Wonder why I didn’t include succulent wreaths? Well, there are so many gorgeous ones, I created a Pinterest page for the best of the best! How to select, grow and design with cold climate succulents—sedums, sempervivums and more. Becky Sell of Sedum Chicks plants cold-hardy succulents in repurposed wood-and-metal containers, hypertufa pots, wreaths and more. She grows the plants, too, where she lives in Turner, Oregon, near the Washington border. Becky’s compositions can overwinter outdoors in northerly climates (Zones 4 to 8), providing the potting medium drains well. 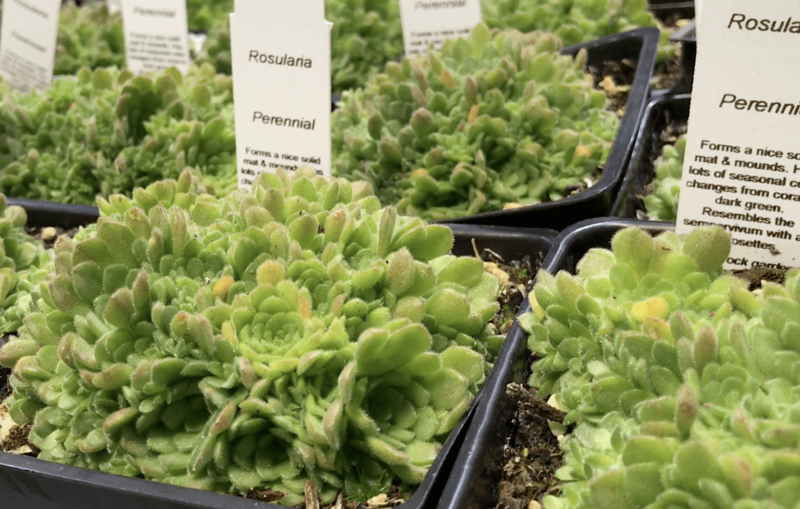 Cold-hardy succulents such as stonecrops and hens-and-chicks will also grow in Zones 8 and 9 if protected from heat in excess of 85 degrees and scorching sun. Some varieties, notably shrub sedums, die to the ground in any locale and come back the following spring. There are about 35 species in the genus Rosularia. The sempervivum-like succulents come from Europe, the Himalayas, and northern Africa. Find more photos of succulents for Northern climates—including many of Becky’s favorites—on my website’s new Cold-Hardy Succulents page. I photographed the designs shown here during the Northwest Flower & Garden Show at the Sedum Chicks booth, which won an award for outstanding visual appeal. Below: This bright red vertical container was a hit. At right, I darkened the photo to make plant IDs, in white letters, stand out. Below: Sempervivum ‘Jade Rose’ repeats the teal blue of a Sedum spathulifolium cultivar. Below: In a cold-hardy wreath, Becky surrounded a large sempervivum rosette with smaller sedums, Delosperma cooperi (at lower left), and Sedum confusum (lower right). Below: I’ve ID’d the three sedums in this wreath at right. Becky gives her plants “hair cuts” to keep them compact. “I like its dark edges,” Becky says of Sempervivum ‘Black’, shown below in dramatic contrast with chartreuse Sedum ‘Lemon Coral’. At lower right is a succulent native to Oregon: Sedum oreganum. Becky and husband Paul create planters from repurposed wood and metal. The bronzy succulents below are Sedum confusum, which blushes red-orange in a sunny location. When less confused, it’s bright apple green. For wreaths and vertical gardens, Becky uses sphagnum moss to help hold plants in place. She emphasizes the importance of good drainage, which is true for all succulents, but especially those in rainy climates. Succulents from cold climates tend to have thin or small leaves and want a richer potting soil than thicker-leaved varieties from desert regions. Becky recommends Black Gold’s organic mix. 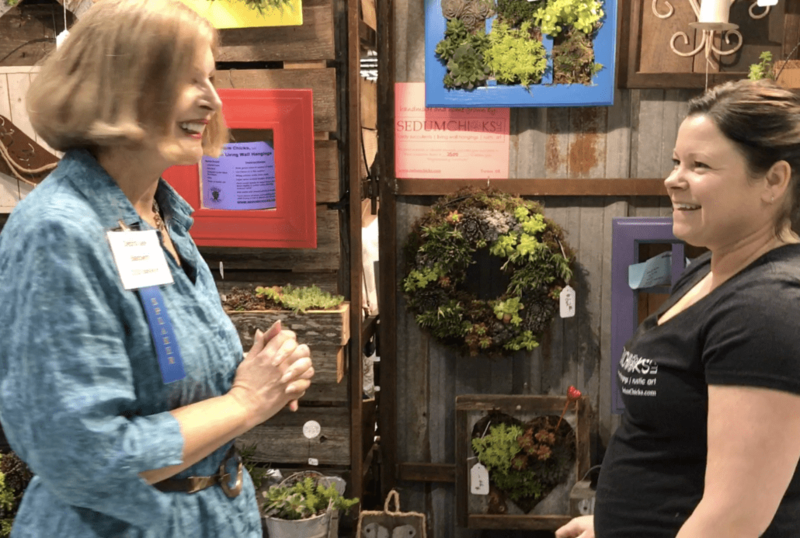 In my YouTube video, “Sedum Chicks at the Northwest Flower & Garden Show,” Becky explains how to select, cultivate and beautifully combine cold-hardy succulents. How to Grow Tender Succulents in Northerly Climates: Resources and info for growing tender succulents in cold, northern climates. Designing with Succulents (2nd ed.) 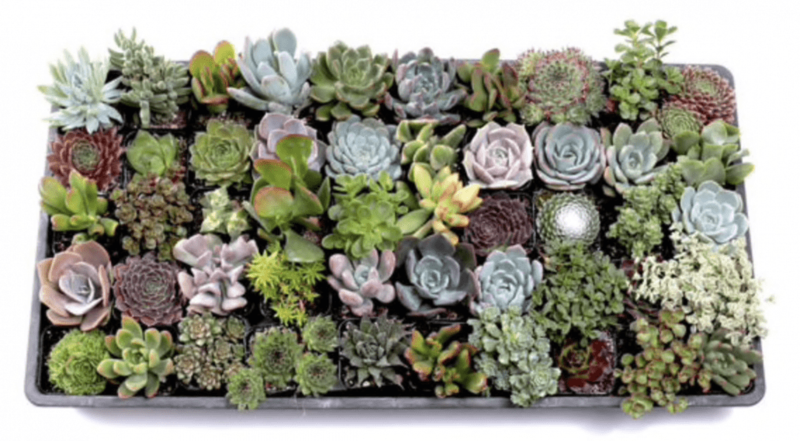 See the section on Cold-Climate Succulent Gardens. All my books show design ideas and give care and cultivation for Sedum and Sempervivum. 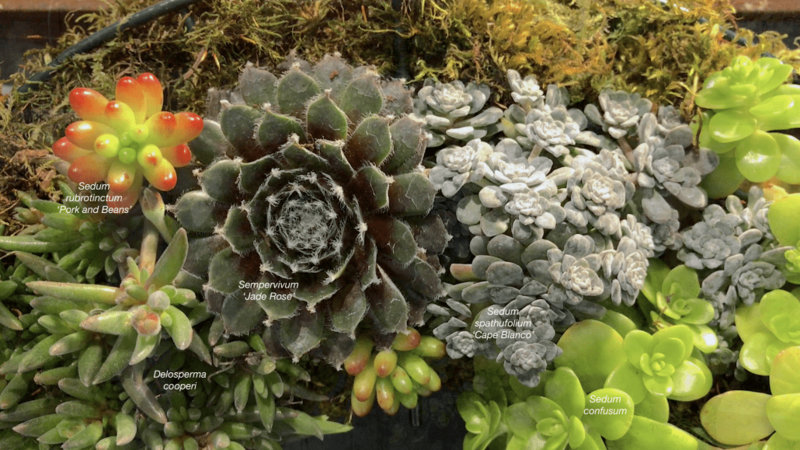 — Growing Succulents in Northerly Climates, Sempervivums Gorgeous new cultivars and design ideas from my presentation at the Northwest Flower & Garden Show. — Growing Succulents in Northerly Climates: Sedums and More More cool succulents for cold climates plus how to select, grow and design using them. From my second presentation at the Northwest Flower & Garden Show. — Sedum Chicks at the Northwest Flower & Garden Show. Designer/grower Becky Sell of Turner, Oregon explains how to beautifully combine sedums, sempervivums and other cold-hardy succulents. — Make a Frost-Hardy Succulent Wreath with Hens-and-Chicks. Simple steps to a stunning wreath!